Like with so many foods invented in this country, the question of when and how maple syrup was first discovered is surrounded by legends and folklore. Probably the most popular of these stories is that an Iroquois Chef named Woksis threw his tomahawk at a tree releasing a clear sap that his wife used for boiling their evening venison. The result was a sweet and delicious meat that delighted the chef. From this beginning, syrup making became popular with Native tribes throughout the northeastern part of North America. In early spring they would collect the sap which they called “sinzibuckwud” (literally meaning “drawn from wood”) from maple trees into birch bark containers or hollowed-out logs. Excess water was removed from the sap by dropping red-hot stones into the liquid or letting it freeze overnight and removing the layer of ice that formed, resulting in a thick sweetener. Early European settlers quickly learned this age-old practice and soon began introducing a number of methods for improving the process–drills for tapping the trees, metal spouts and wooden buckets for collecting the “harvest,” and copper and iron kettles for boiling the sap into syrup. For early settlers and colonists, maple syrup was not only a major source of sweetener, but surplus production was sold or bartered to provide goods not produced on the farm. Up until the Civil War, maple syrup found its way into all kinds of products due to the expense and sometimes unavailability of can sugar. After the war, as the price of cane sugar lowered and its availability became more certain, demand for maple sugar lessened. 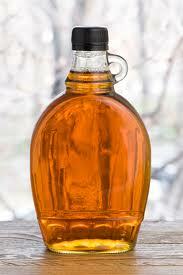 By the first of the 20th century, large producers were formed and maple syrup became a specialty product. Today, Vermont is the largest U.S. producer of maple syrup, supplying over 5.5% of the world supply, followed by New York, Maine and several other Northeastern states. Strict standards of purity–called grades–for maple syrup are set by the U.S. Department of Agriculture. Grade A syrups come in three varieties: light amber (sometimes called “fancy”) is the preferred grade for table use, while medium and dark ambers are enjoyed by those who enjoy a stronger maple flavor. Grade B is very dark and primarily used for cooking since it is too rich for most personal tastes. As the natural foods movement has become more popular in recent years, maple syrup has become increasingly attractive as an alternative to processed sugars from beets and cane. In fact, the maple syrup industry has enjoyed an almost 50% growth over the past five years, with devotees using the sweet liquid in everything from drinks and desserts to savory dished like the Maple Glazed Grilled Salmon and other recipes found on this site. And never let us forget the old standby favorite way of enjoying maple syrup–over a warm stack of pancakes or French toast. This entry was posted in Breakfast, Desserts and tagged colonists, foods, New England, Vermont by grubamericana. Bookmark the permalink.